We wanted to go into Georgetown today for propane and to update some charts with a good wifi. A “friend of a friend” was in Georgetown for a few weeks, so we arranged to meet each other. Donna is from Canada and owns a house here on Great Exuma, about 4 miles outside of Georgetown. She and Kaye Leslie, from Toronto, met in college and have been friends ever since. Kaye was trying to coordinate visiting us and Donna at the same time. But Donna’s house was damaged by hurricane Matthew and under repair. 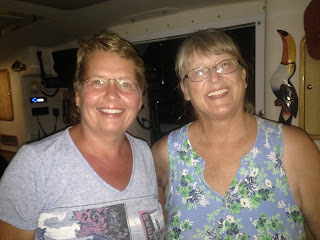 We met Donna and her friend, Gayle, at Eddie’s Edgewater bar and grill. We had a nice lunch. And it was interesting to find out about owning property in the Bahamas. And they were interested in our sailing life. They had free wifi at the restaurant, but it wasn’t updating the charts. So Dave left us and went to J&K Productions while we visited longer. I later joined Dave. It was fun to visit with Julius, Krystal, and their son Travis. We are old friends after a couple of years of doing business with them. We pay them $5/day/device for wifi. They have a stronger connection than you can get in a restaurant. We got back to the boat about 4:30 and we had a 5:00 dinner invitation. My friend, Cheryl Ulmer, from Rapid City, SD, is here as crew on a sailboat. They had caught a 50 inch mahi and wanted to share it with us. We all went to another boat, Ed Horton’s. Cheryl was crew for him last year for about a month. Fun night getting caught up with everyone.